My first baby (I will always call all my kids my babies!) turned 4 this last week! She is no longer a toddler and is growing into a little girl! I am having a hard time with the whole growing up thing already and she is only 4! I was talking with my sweet girl trying to decide what kind of party she wanted to have? She doesn’t watch a whole lot of TV so there wasn’t anything like that that appieled to her. We looked around Pinterest together and she pretty muched liked everything! Just like her mama! Then it hit me, she LOVES to help me in the kitchen. 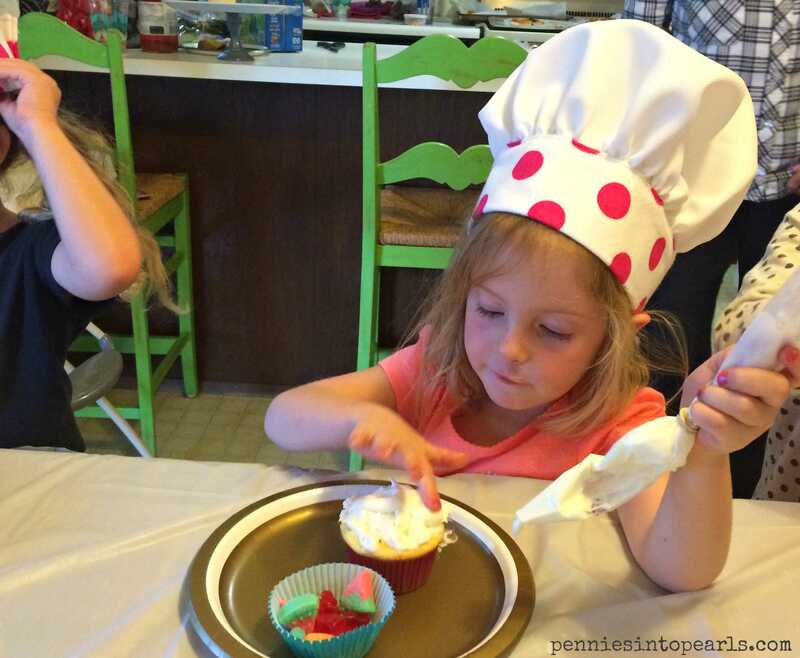 So what better theme for her party then a Chef Party?! She loved the idea! And that was that! Decision made! 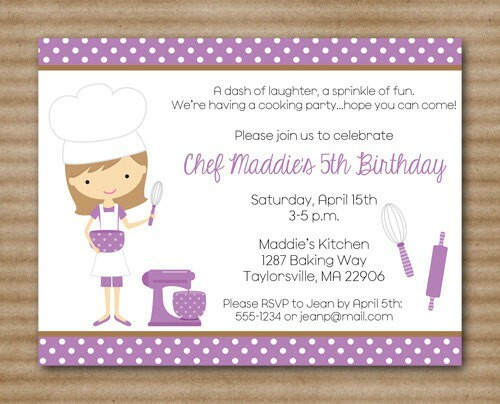 First let me talk about how cute these party invitations are from Paper House Designs! I thought about making invitations by hand or with my Cricut but decided that was too much time for something that the kids wouldn’t even notice. So I took to the internet and wound up on this super cute Etsy shop called Paper House Designs! Aren’t these just so perfect! 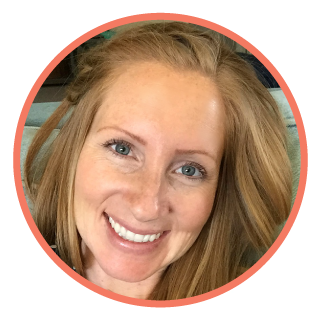 Kim has hundreds of designs to choose from all in an easy to print format! Some are cute blank cards but the options for holidays and celebrations to choose from seem endless. You WILL be able to find something you love! If you are not in the need of something today you need to make her one of your favorite Etsy shops so you can refer back. Because we all need a cute card every once in a while! She does such a wonderful job customizing the cards to just what you need and want, with all of your details included. My little girlie had so much fun handing them out to all her friends and our family! What’s more is Paper House Designs has really great prices! Way cheaper than anything (not customized) you could find at a store. Not to mention they are 100 times more cute! Not only does Kim do an amazing job on these customized invitations but she is super professional and responds to any questions very quickly! For a limited time only Paper House Designs will be offering a special just for Pennies into Pearls readers! You can receive 10% the already great prices by simply using the code PenniesIntoPearls. Do you have any birthdays, anniversaries, cute parties coming up? Think about what you have coming up and put your order in now and save! 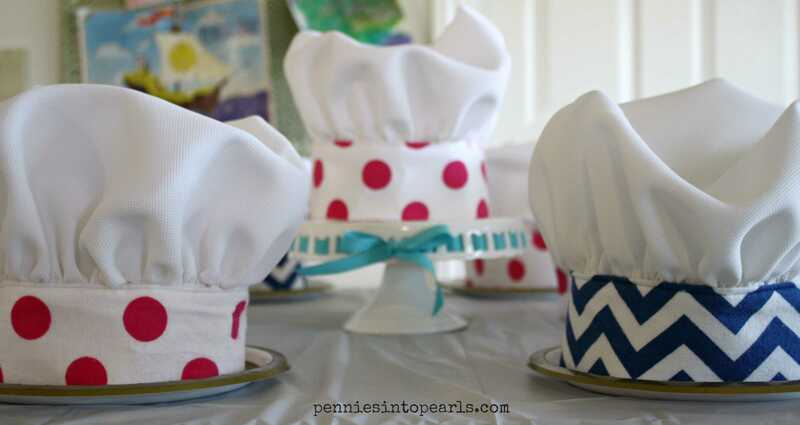 Now what’s a chef party without any chef hats? Right? I new right away that this was one thing I was going to be dedicating to for this party! 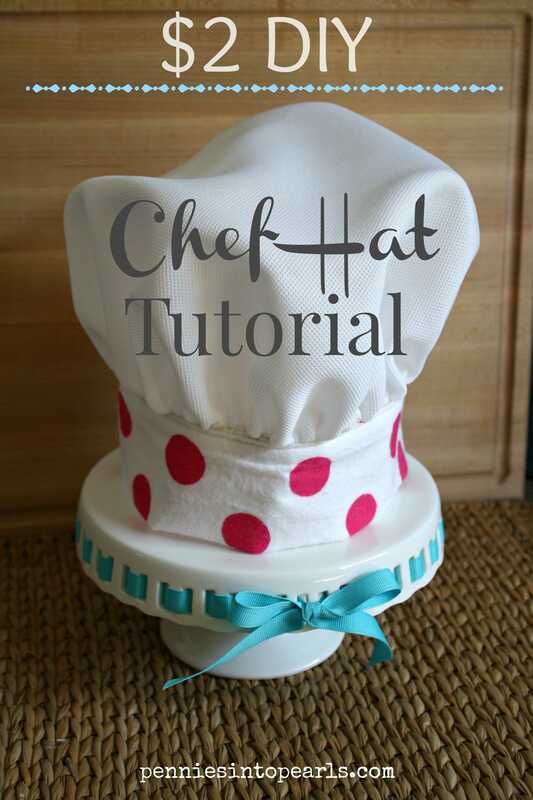 Before I begin this chef hat tutorial lets just point out the elephant in the room. 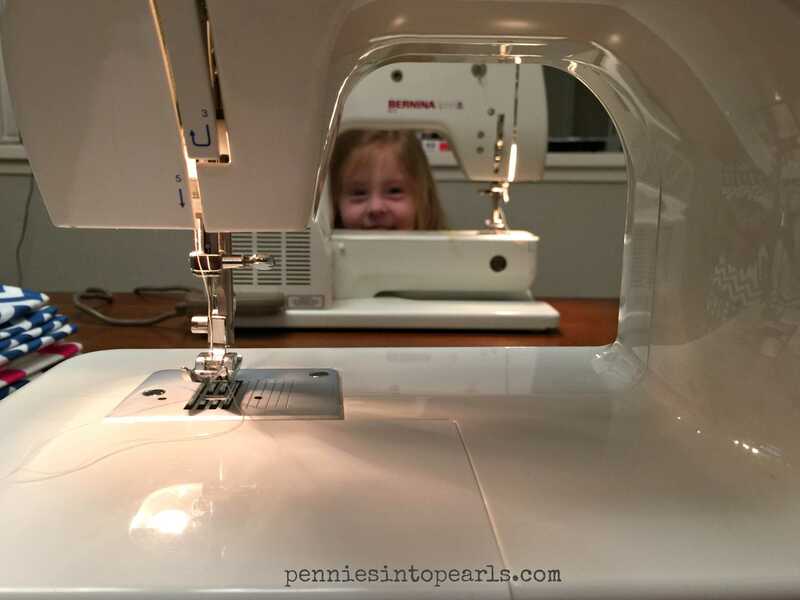 This is my first sewing tutorial and I am by no means what you might call a seamstress. I apologize for any pictures that might be lacking and all the bad lighting (having to work at night). But! 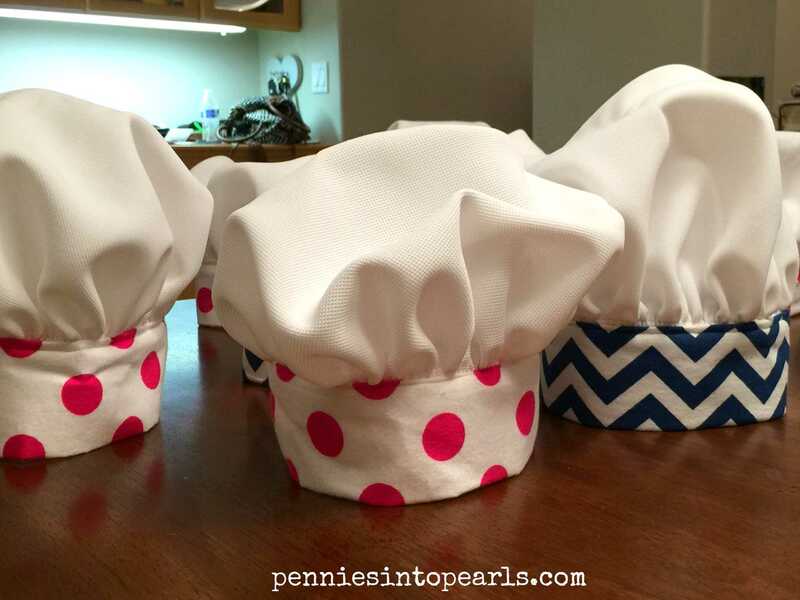 This project is super easy that any novice can make these for sure! Please leave any questions you may have in the comments below and I will get back to you to help out! Of coarse the first thing you need is a helper! Maybe not… But my mom did stay up late and help me finish these in time for the party the next day! Thanks mom! Second thing you need to do is cut your fabric pieces. The easiest way to do this is to make a template out of paper. We took a large piece of paper, a pencil with a string attached. Holding the string at the center of our circle we pulled the pencil out 9 pinches. Then pulled the string tight and traced out our circle. Use this as your template to cut your fabric. Side note: how did I make these hats for less than $2 a piece? I found a huge white table cloth at a thrift store and got it half off making the entire piece of fabric $2.50. Next I went searching for some cute fabric at Joanns and all their cozy felt was on sale for $1.50 a yard, so I bought about 4 yards total. I also needed some supplies like the binding tape that I used my 40% off coupon, of coarse! 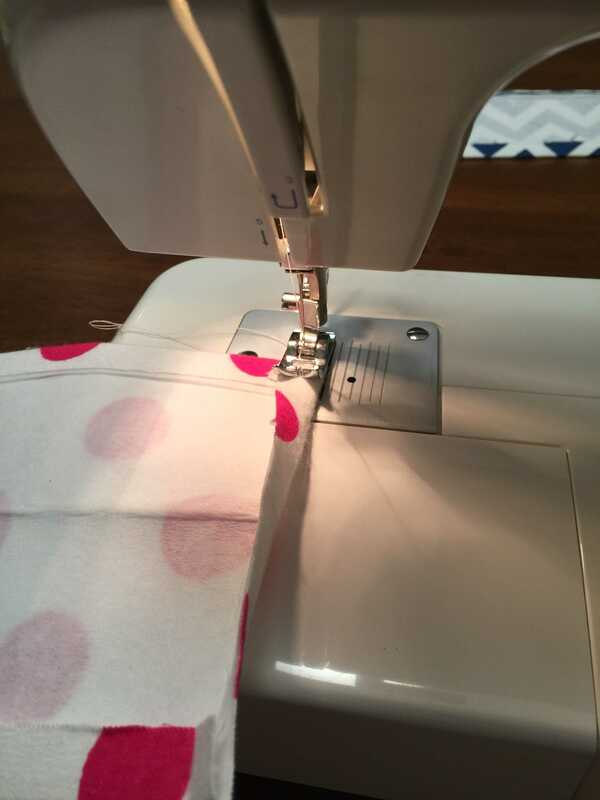 After cutting your fabric and interfacing you can now iron your rectangle piece of fabric and interfacing together. 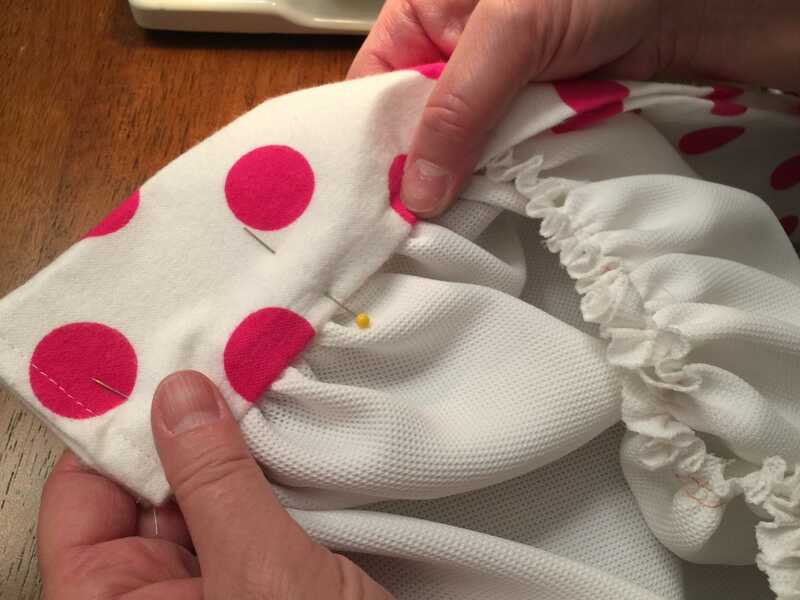 While you are still over at the iron, on each long end of your fabric/interfacing piece, fold about ½” press with the iron. 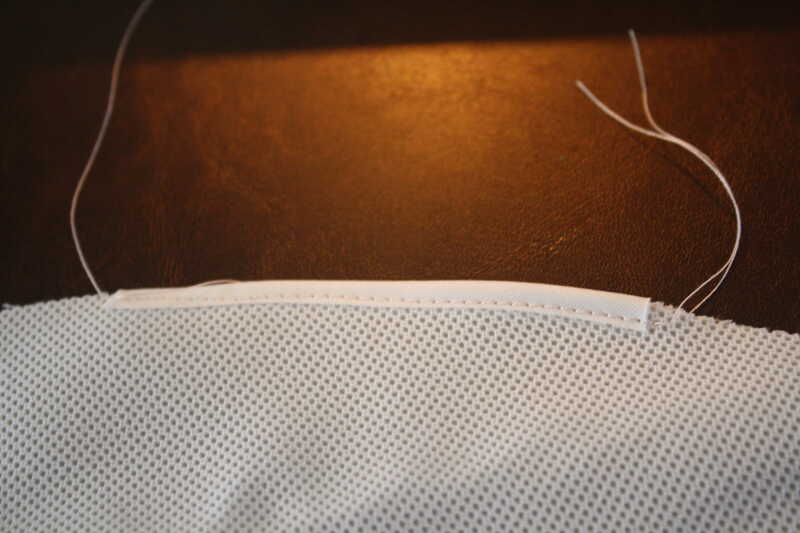 On each short side also fold about ½” in, press and stich to keep in place. Now fold piece in half length-wise so the good side is facing out. Press with the iron. 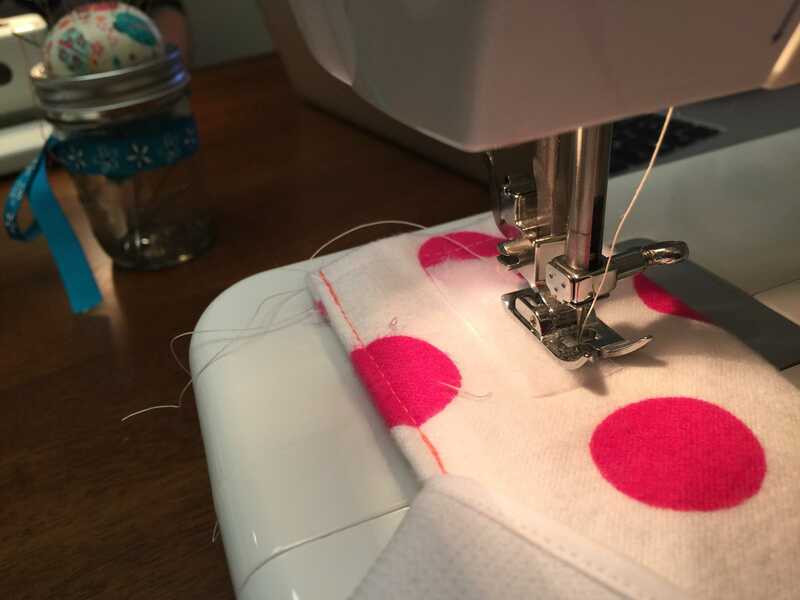 Now on your circle fabric piece, take your 3” piece of bias tape and place it around one section of the fabric. Stich in place. 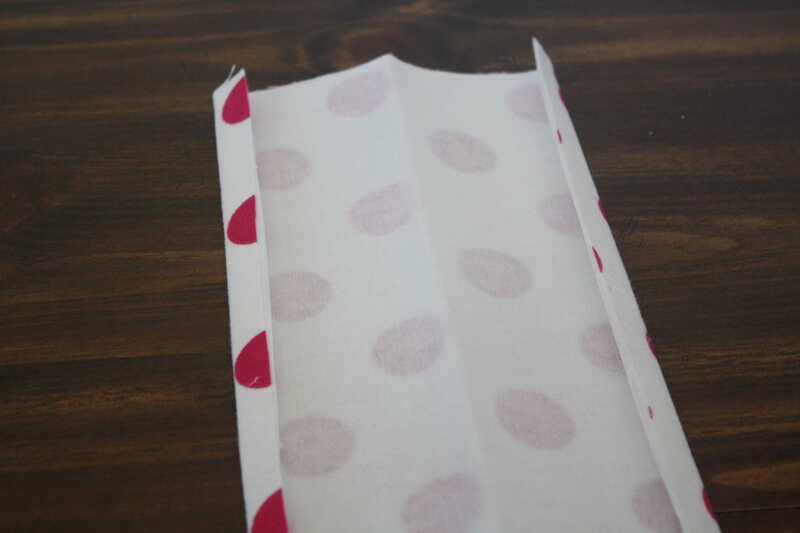 Starting on one end of the bias tape you are going to sew a gathering stich around the perimeter of the fabric. Starting at one end of the bias tape working in the opposite direction until you reach the other end of the bias tape. (This is easy, don’t worry if you don’t know what a gathering stitch is. I didn’t until my mom showed me) All this means is you are going to sew two parallel stitches using the largest or longest stitch you have. Make sure to leave plenty of thread at the beginning and end of your stitches. Now while holding one end of the threads from your gathering stitch start pulling the fabric to create a gather. You need to be careful you don’t pull too hard our your thread will snap but you will need to pull firmly. Insert the gathered fabric about ½” into your folded rectangle fabric. Adjust so the pieces line up, you might need to let out some of your gathering if the circle piece seems to small. Pin in place starting and stopping about a ¼” over the bias tape on each side. You are ready to sew into place. 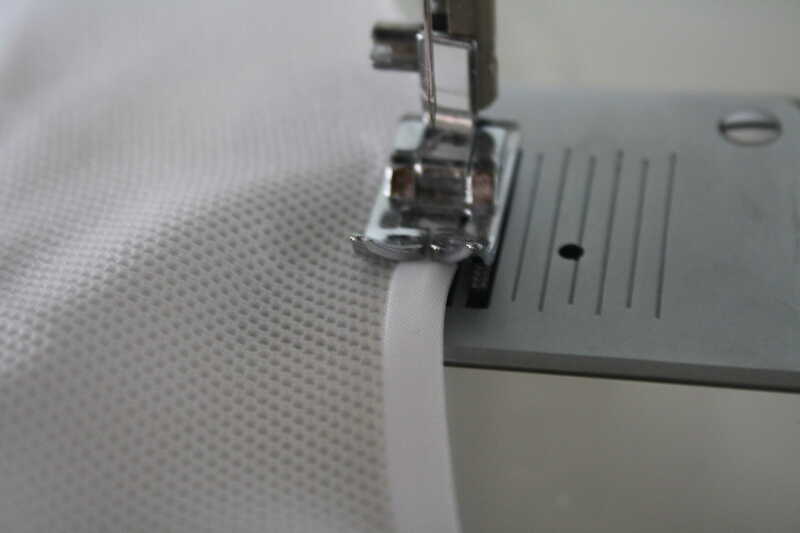 Sew as close to the edge as you can making sure that your stitch is catching all three layers. You are almost done! 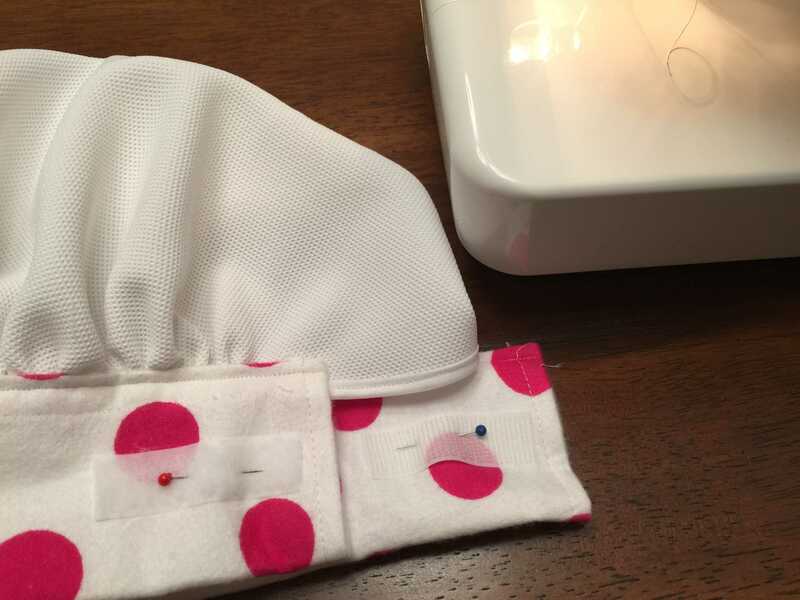 Pin your Velcro in place and sew along all four sides of each piece of Velcro. You did it! To be honest I was really surprised how well these hats turned out! They actually looked like something you could buy at a store. At least in my very limited sewing knowledge opinion. 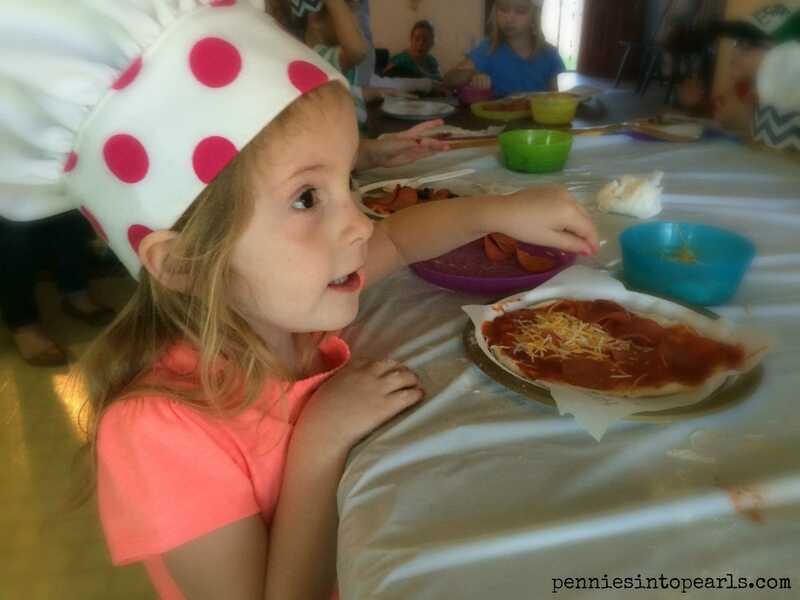 My sweet girl was super excited to wear her hat and so were all the kids at her party! 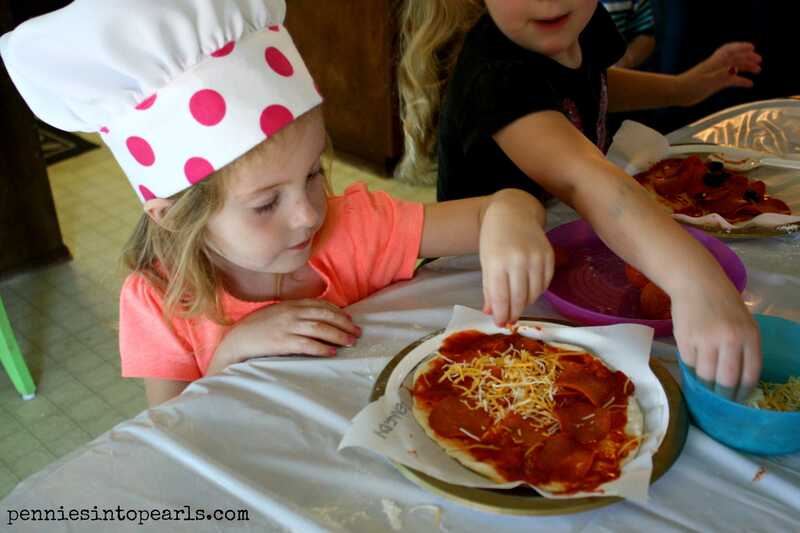 They all looked over the top adorable together with their little chef hats on making their pizzas! Our poor little man was sick and had to miss out on the party (don’t want to share any sick germs!) 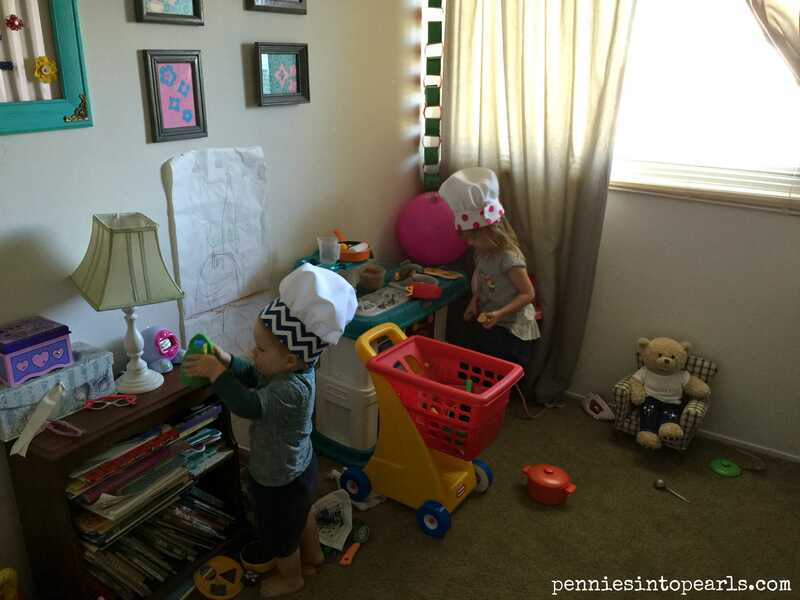 but even now that the party is over, they both still love to put on their chef hats while playing in their kitchen. Don’t forget to check out my Link Parties page to see where I share all my ideas and find others for inspiration! Thank you so much Solveig! This makes me so happy to hear! I am sure they will love them! I would love to see how they turn out! Tag me on Instagram @PenniesIntoPearls Merry Christmas!